Hartford, Connecticut is known internationally for its Mark Twain House. Lesser known, not a hundred yards across lovely grounds, is the Harriet Beecher House. Twain called this little oasis Nook Farm, and he intended to add other writers to his property, an artist colony that never quite got off the ground. In 1995 I took visiting friends to tour both houses and we made the perfunctory visit to the gift shop. I picked up a little pamphlet about Stowe and was much surprised to find that she shared the same death year as Clara Schumann, 1896. 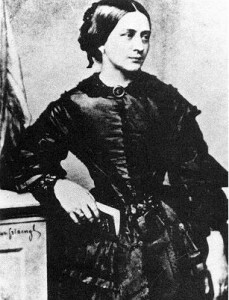 I had every intention of scripting a show about Clara Schumann the next season—a 100th-year commemoration of her death. There were more parallels between Clara and Harriet: Both women were raised by their fathers, both were the breadwinners of their families, each outlived all but three of their seven children, and they had companionate marriages—marriages of equals. And they could have met during Beecher Stowe’s visit to London—same time that Clara was performing in Wigmore Hall. This was connective tissue enough for me and I created a scenario of letters, spanning four decades. Unable to visit Clara in person the day after her performance, Harriet leaves a “fan” letter as she catches the train to Scotland on her European whirlwind lecture tour. She’s now the world-famous author of Uncle Tom’s Cabin. Eventually, Clara sends a response when Stowe has returned to Hartford. The action is set. The work was wonderfully premiered by Jill Clayburgh, and Sandy Duncan also has a great affinity for it. Postscript: Nancy Reich, the foremost biographer of Clara Schumann, was most helpful to me and graciously attended several performances. 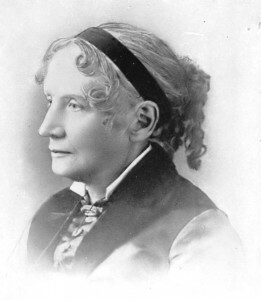 A couple of years later she was lecturing at Yale’s Norfolk Music Festival and in the Q&A an earnest audience member asked her if she was aware of the newly found correspondence between Clara Schumann and Harriet Beecher Stowe! Nancy did not give away the secret of my historical fiction, what a lady, but it made me aware that I better fess up when this is the case. PPS: The word glance has a completely different meaning now than it did in the 19th century. A mid-19th-century Webster’s Dictionary defines glance as a prolonged and thorough study of an object or idea.